When we are using the word "meditation", most people think about long periods of seated silence that continues even when the back becomes uncomfortable, the legs go numb and all the body wants to do is move. Here in the Desert Ashram, you can learn a wide variety of meditations filled with free dancing, ecstasy, and life! So take a deep breath and join us in a fascinating journey into yourself. By the way, we remind you that all who want to come to the Desert Ashram for a deep process, community life, and to practice meditation with us is more than welcome to join the Womp program – the work and meditation program of the Desert Ashram. Fundamentally, meditation is introspection. We are so busy at looking outside, judging, responding and being attached to our opinions that we forget to see what is happening deep inside. Practicing meditations allows us to dive into ourselves. Observing with no judgment, no condemnation, accepting and staying present (observing) allows the meditator the ability to go into relaxation and deep peace. But like anything else, meditation requires practice so you can go deeper and understand the full process of learning patience. OSHO meditation techniques are built for the western man, so he could experience the meditative peace. 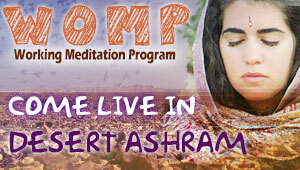 We in the Desert Ashram practice OSHO meditations as a community twice a day and everyone can participate. How do I know which meditation to choose? Try every meditation a few times. The meditation that feels right for you is the one that you should keep doing. If it is possible, try every meditation for three days. We suggest that you take part in all of the meditations offered while you are here. OSHO suggested opening the day at sunrise with his special meditation technic called Dynamic and at sunset he suggested Kundalini. Kundalini meditation, like Dynamic, allows the meditator to release and observe, and as a result, experience an inner peace. Is there is a place to study and practice the meditations? Indeed! In the Desert Ashram, we run multiple famous meditation camps. Here are some details on OSHO Intensive and if you want to go even deeper, we offer our Meditation leader course at the same time. Can I continue practicing the meditation at home? Yes, of course. You can purchase tapes and CD's on the OSHO international website; there are also lots of books on meditation. OSHO or Chandra Mohan Rajneesh (17/12/1931 – 19/01/1990) is an Indian enlightenment teacher who walked around India and the world in the middle of the 20th century. He gave lectures about awareness, meditation and many others subjects on human nature and the homeland rights for freedom. OSHO developed active meditation which is customized for the modern westerner. His attacks against organized religious institutions, his differing beliefs about morality, and support for free sexuality established him many enemies. Yet, his circle of disciples grew and continues to grow. These people are called Sannyas. The OSHO International Center, known as the Osho International Resort, is located in the OSHO Ashram in Pune, Maharashtra in India. The credit to the discovery of meditation has been given to Siddhartha Gautama, the Buddha. Before the Buddha was born, different ethnic groups were doing different styles of ceremonies which are viewed as meditation. The Buddha was the first who taught a structured teaching practice – a guided process allowing the human to experience his whole being and to connect to the here and now. He called this Vipassana. Without going too deeply into this wonderful technique of Vipassana, this practice mostly involved sitting with eyes closed and without any movement. OSHO developed a now concept- the active meditation. OSHO thought that the modern western man is not built to sit still in the present without his mind wondering to thoughts about the past and the future. The western mind is different said OSHO, and for him, the western world needs meditation techniques that are built scientifically to make the "noise" that the mind creates to go away. In most meditations that OSHO built artfully, there are active exercises followed by silent sitting with eyes closed. OSHO took activities that are not usually viewed as meditation, like dancing, and inserts the quality of the meditation into it. Meditation is a fun thing to do. Sometimes, at first mainly, there might be the feeling like you need to force yourself to do it, especially in meditations like Dynamic which requires physical activity early in the morning. Do it! Go to meditation! Soon you will discover the benefits of it and the great contribution in meditation.